ZebraCoupons is pleased with all the attention that their new website is getting! They have offered our readers another 100 promo codes to get you a Free Coupon envelope (no shipping charge). Get over $60 worth of coupons sent to you in the mail. Normally there is a $2 shipping charge for the order to get the coupons mailed to you. For a limited time, while quantities last you can get it your order for free! Websaver/ZebraCoupons continue to work with members of our Canadian community to bring about more brands to the Mail to Home offering as well as figuring out creative ways to get Mail to Home Coupons in the hands of shoppers in an efficient and effective way. Including promotions / ways that allow shopper to get them for free. To get a promo code, please subscribe to our Facebook group here and write me a comment that you want a promo code on the ZebraCoupons promo code giveaway post. 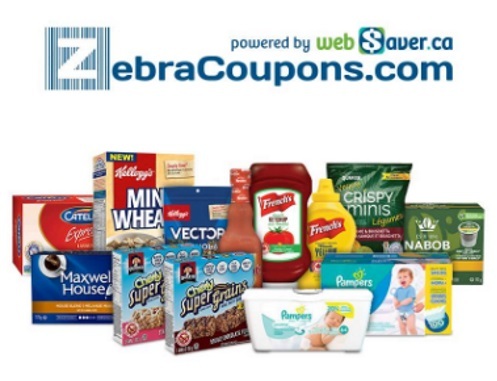 To get the coupons head on over to ZebraCoupons, add all the coupons that you'd like to your cart, and then enter the promo codes (that I will provide in my group) at checkout to get Free Shipping. Limit 1 promo code per person. Promo codes are valid for a limited time, so get your order in right away! Promo codes expire Sunday April 2 2017 at 11:59pm ET so be sure to use it asap. Just waiting to be approved to the closed group - but yes please I would like a promo code to try this service! Hoping to save up for a printer, but in the mean time this would help me get back into couponing!